Since David Hudson first spoke of the materials that he rediscovered people have been trying to come up with ways to define them. Hudson called these materials “ORME” or “ormus” and he claimed that they were the same as the biblical manna and showbread. He referred to them as the “white powder of gold” and the “Philosopher’s Stone” but some of these terms were clearly used as subcategories of ORME, the generic name that he used in his patent. Some people have attempted to redefine these terms in such a way as to imply that some subcategories of the material that Hudson described are inferior to other subcategories. It appears that they may have done this to try to enhance the value of their own product while diminishing the value of the products of others. I believe that the following definition is the most appropriate at this time: ORME, ormus and m-state all are generic terms which apply to any normally metallic elements in a spectroscopically “invisible” non-metallic form. These terms apply regardless of which method was used to obtain them or the relative effectiveness of the element. David Hudson was referring to the gentleman that we call the Essene. I learned how to make the white precipitate from the Essene on May 18, 1997. He called all of the white precipitates from various sources “m-state” . These sources included the white precipitate from the Wet Method on ocean water or Dead Sea salt and the white precipitate from the Sodium Burn on metallic gold and black sand. He also referred to David Hudson’s products as m-state and, when I told him of the substances that Jim made from metal using ozone we both spoke of these substances as being m-state materials. The Essene also applied this term to these elements in their natural forms; i.e. in rock and ocean water. Since he coined the term “m-state” I think that it is reasonable to accept his usage of the term. Whatever generic terms we apply to these substances may also have to apply to the “oil” form as described by Jim, Kevin, Gary H. and David Hudson. In his patent, David Hudson made a distinction between ORMEs and S-ORMEs. He claimed that the ORMEs existed in nature and tried to patent them. The S-ORMEs, according to Hudson’s patent, were a refined form of the ORMEs which were capable of certain superconductive behaviors. Jim based his magnetic trap on the theory that S-ORMEs also exist in nature and that all one has to do is to bump up their energy levels a bit by spinning them in a magnetic field and they will exhibit superconductive behaviors like levitation. In his 1999 Dallas lecture David Hudson gives a fairly good description of his first encounter with the substances he was later to name ORMEs. In this story he tells about how he placed activated charcoal in the water from a volcanic hot spring and was able to get a bead of the precious metal elements when he had these charcoal pieces fire assayed. In another lecture, Hudson describes the loaded charcoal as being full of an oily substance. Jim also noticed an oily (Jim called it “snotty”) substance in his charcoal briquettes. Like David Hudson, Jim claims that he has taken bits of water soaked charcoal and extracted metallic gold from them. I heard Jim talk about this in 1989, six years before either of us heard of David Hudson. During one of my early visits with the Essene, he spoke of how he had taken a natural source of m-state iridium and made a levitating disk from it. This would also suggest that his use of the term “m-state” included the superconducting form that Hudson called S-ORMEs. The Essene never demonstrated this to me so I cannot confirm it from my own experience. Of course David Hudson has not demonstrated his levitating material to us either. I guess we just have to take their word for this claim. It was our intention to honor Hudson by using his term “ORMUS” and to honor the Essene by using his term “M-State” . Both of these terms were originally used to cover all of these elements as they occur in a non-metallic form in nature. This gentleman was quite insistent that we not use the acronym “ORME” in describing these materials but was okay with using the terms “m-state” and “ORMUS”. For these and other reasons we rejected the use of the acronym ORME (which stands for Orbitally Re-arranged Monoatomic Element) since David Hudson and his scientific consultants have not provided any conclusive scientific evidence, that these materials are orbitally re-arranged or monatomic, to the public. Of course this does not prevent Hudson and others from using terms like “G-ORME” or “S-ORME” to refer to specific forms of the ORMUS elements. It also does not prevent the Essene from using specific terms to refer to things like m-iridium, M-1, M-3 or C-11. In fact, I am sure that a lot of new terms will be coined to refer to specific forms of the ORMUS materials. While we have not seen any clear evidence that these materials are monatomic, diatomic or something else we still need some way to distinguish them from their metallic form. I do think that there is enough accumulated evidence to say that these elements in the ORMUS form do not respond to most types of spectroscopic analysis in the same way as they do in their metallic form. If there is a single defining physical property for the ORMUS elements it would have to be this spectroscopic ambiguity. It sometimes even looks like they are something else when they are assayed spectroscopically. Some of the best work we have in the area of spectroscopic analysis is the work that August did. August compared the x-ray fluorescence of metallic gold, m-state gold made using the sodium burn, Dry Method precipitate and ocean water precipitate. August’s work suggests that these substances exist in nature and are not spectroscopically visible in the expected way. In summary, it appears that there is a class of materials which do not show up in regular spectroscopic assay. David Hudson called these materials ORME which suggests that they are monatomic and the Essene called them m-state which also suggests that they are monatomic. The scientists that I mentioned above and other scientists and lay people agreed that we should not try to impose Hudson’s way of thinking on the world by using the acronym for Orbitally Rearranged Monoatomic Elements when David Hudson himself never provided any scientific evidence that these elements were monatomic. We decided to honor David Hudson by using a term that he suggested, “ORMUS” and to use the Essene’s term “m-state” (which could stand for “manna state” as easily as monatomic state) when referring to these materials in a generic way. North American hardback published in September 2005 by Barnes & Noble, ISBN: 0760775982, available at amazon.com. Extracts:From the royal tombs of pharaonic Egypt, to the laboratories of modern science, comes the extraordinary account of gravity defiance and teleportation in the ancient world. The Book of the Dead refers to a hyper-dimensional realm called the Field of Mfkzt, which is now determined as a superconductive energy field of high-spin metallurgy. Liaising with modern physicists, Laurence Gardner has ascertained that mfkzt (known today as monatomic gold) was the secret of the pharaohs’ rite of passage to the Afterlife, and was directly associated with the pyramids and the biblical Ark of the Covenant, as revealed by inscriptions at the Sinai mountain temple of Moses. No reason is given in the Bible as to why the Ark of the Covenant was so richly contrived. It is portrayed as having awesome and deadly powers, but these are not satisfactorily explained. There is, however, no mystery to the Ark. Laurence Gardner explains that its story is wholly related to the dynastic House of Gold – the Messianic bloodline of ancient Grail Kings from the Old Kingdom pharaohs to King Solomon and the descendant Royal House of Judah. What was the Ark of the Covenant? Where is the Ark? What were its relationships to the Golden Fleece and the Philosophers’ Stone of Nicolas Flamel? In fact, what is the Philosophers’ Stone – and how does it work? By accessing Rosicrucian, Templar and Royal Society archives, these questions are all addressed and answered by Laurence Gardner in Lost Secrets of the Sacred Ark – thereby revealing the long forgotten secret of Royal Arch Freemasonry. In the field of quantum mechanics, NASA scientists have recently confirmed that matter can indeed be in two places at once. It is now an established fact that, through quantum entanglement, particles millions of light-years apart can be connected without physical contact. Space-time can now be manipulated; teleportation is becoming a reality; gravity-resistant material is now heralded for air transport, and virtual science has led to a greater understanding of hyper-dimensional existence. In Lost Secrets of the Sacred Ark, Laurence Gardner reveals that the keys to all this are: (a) Mfkzt – referred to by the Institute of Advanced Studies as ‘exotic monatomic matter’, and (b) the amazing technology of Superconductivity – acclaimed by the Center for Advanced Study as ‘the most remarkable physical property in the universe’. When we look back at the histories and legends of ancient times we find many mysteries and puzzles that are still waiting to be solved. Many of these ancient puzzles involved a mysterious material which had magical properties. The ancient alchemists of China, Israel, India, Egypt and Persia spoke of such substances. They called them Soma, the Elixir of Life, Chi, Manna, Prana, the Philosophers Stone, Shewbread, & King Solomons gold. These substances have been associated with other ancient mysteries like the Fountain of Youth, the Ark of the Covenant and the Great Pyramid. They were also often associated with miraculous healing properties and mystical abilities. Ancient Jewish commentaries describe how the Ark of the Covenant would levitate when it was brought out on holy days. According to the Zohar, the ancient Jewish priests would tie a rope around the ankle of any priest who was going into the presence of the Ark of the Covenant so that they could safely pull him away from the Ark if it zapped him. The Ark of the Covenant was used to store (and perhaps charge) the pot of manna saved by Moses. Moses took the golden calf which the Israelites made for worship “and burnt it in the fire, and ground it to powder, and strawed it upon the water, and made the children of Israel drink of it”; presumably in order to improve their spiritual connection. The ancient Egyptians had the “shem-an-na” which the Book of the Dead refers to as “what is it”. The shem-an-na was called both bread and gold and given in a cone shaped loaf as an offering to the gods. Above we see “on the left the king, ‘Son of Re Amenhotep, ruler of Weset’, offering a conical loaf on a cup to ‘Sopdu, the great god of the east'”. This is also called the “gold of reward”. Modern science has generally dismissed the stories of these amazing substances as being fantasies and fictions of ancient superstitions and religions. Perhaps scientists have been too hasty in dismissing these ancient and mysterious substances. Let’s look at some of the properties that have been claimed for these things. The manna of the Bible (which appears to be similar to the shem-an-na of ancient Egypt) is described as like “coriander seed, and the colour thereof as the colour of bdellium.” The Israelites “ground it in mills, or beat it in a mortar, and baked it in pans, and made cakes of it: and the taste of it was as the taste of fresh oil.” It arrived in the morning with the dew. – 1 – They are a form of gold, silver or other precious metal elements. – 2 – They have an oil form. – 3 – They can be dried to a white flour like substance. – 4 – They exist as a gas or vapor which can be extracted from the air. – 5 – They can be energized or accumulated in structures like the Ark of the Covenant or the Great Pyramid. – 6 – They should levitate under certain circumstances. – 7 – They have remarkable healing and spiritual properties. – 8 – They would have to be difficult to identify using modern scientific tools because they have not been identified this way before. I am writing this article to report that numerous scientists around the world are finding and working with materials with the properties that I have described above. We are calling these materials the ORMUS or m-state elements. Several of these researchers have converted gold and other precious metals into an oil or a white powder. ORMUS rhodium, iridium and gold. Others have extracted a white powder from ocean water and converted it to metallic gold. One researcher has levitated an oil of gold out of fresh water using a magnetic levitation trap and converted it to metal. Gold from magnetic levitation trap water. Another researcher has extracted the same oil from dew collected at the time of the full moon and from the air by running air through a magnetic Vortrap based on the design shown in the image below. Yet another researcher has reported the formation of the oil of gold on a gold coin suspended from the peak of a frame pyramid. A colleague in Kazakhstan reports that the m-state materials can be energized and accumulated using cone shaped devices. He also reports that they are associated with the energy points which appear here and there on the earth’s surface. I have taken some ORMUS gold powder and gotten it to levitate away from a moving magnetic field. A short video of this can be downloaded off the web. Hundreds of people around the world are working with these materials. Many of them have reported amazing biological and spiritual effects from the use of these materials. A researcher near the US-Canadian border has been growing incredible giant walnuts on a tree he fed with the white precipitate from ocean water. 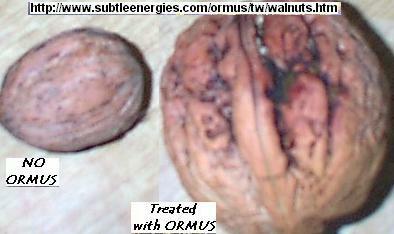 Ordinary walnuts on the left, ORMUS walnuts on the right. 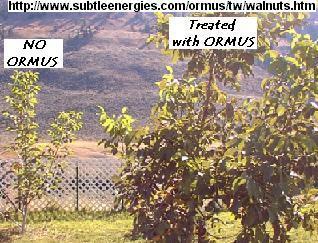 The tree on the left was watered as usual, the one on the right was watered with ocean water ORMUS precipitate. A researcher in Michigan has photographed lights forming off the tips of her orchid cactus plants after watering them with magnetic trap ORMUS water. On the left the light is beginning to form above the tip of the orchid cactus leaf. On the right the light has reached its maximum brightness. This same researcher has been drinking the trap water for a couple of years. She has reported numerous health benefits but one of the most striking benefits has been that a broken tooth partially filled in with new enamel after two and a half months on the trap water. Many other people have reported significant improvement in major health problems such as cancer, aids, multiple sclerosis, arthritis and diabetes. Research is ongoing in the health area and we welcome your stories and comments. Probably the best-known researcher into the ORMUS materials is an Arizona cotton farmer named David Hudson who “discovered” these materials in the late seventies. Hudson researched these materials for a decade and a half before publicizing them in a series of lectures across the United States from 1994 to 1999. After working with the ORMUS materials for several years Hudson realized that their properties were a close match to the properties of the materials that I described earlier in this document. We owe a great debt of gratitude to David Hudson for his efforts to bring knowledge of these materials into the realm of modern science. Since David Hudson announced that he had been “regulated out of business” in 1999 I have been giving lectures and workshops on the ORMUS materials and how to make them in cities around the United States and Canada. Based on my experience in working with the ORMUS materials I will say that they are unequivocally the greatest scientific discovery in human history. They bring together all of the pieces of many ancient puzzles with the pieces of many modern scientific puzzles and they promise to help us see the true picture of the nature of reality as these puzzle pieces fall into place. Barry Carter has been researching the ORMUS materials since 1989. He has started dozens of local and international discussion lists on this subject. You can contact Barry at [email protected] or by calling 541-523-3357 if you wish to get on any of these lists or if you are interested in a lecture or workshop on ORMUS in your area. Indeed white powder gold was used in a series of initiations in Egypt as evidenced when Sir Williams Flinders Petrie uneartherd a temple on the Sinai Peninsula, at Mt Serabit, near Serabit El Khadim in 1903 which was full of alchemical iconography from the time of the 3rd Egyptian Dynasty. In this temple complex a large amount of white powder apparently composed of monatomic elements was found as well as an alchemical crucible. It appears that this white powder gold was one of the primary ingredient in the Bread Of Light used in their sacred rituals. This monatomic Bread OF Light however was used in the context of a deep spiritual path. Unfortunately we have actually read individuals suggest that taking white powder gold once will transform your life. You know that is not true as did the mature spiritual seekers who utilized white powder gold, but more naïve folks are misunderstanding its value. Adolescent spirituality is always seeking the external holy grail that will do that something to them, the if I dont get that pair of Nikes Ill just die mindset is taken into their spiritual quest. If you obtain white powder gold with that mindset youll be disappointed. If you approach with spiritual maturity it can indeed be very powerful. The following sections provide a summary of some of the historical-spiritual traditions that may be related to the monatomic minerals. Ancient alchemical traditions once thrived in the Middle East, Egypt, India, China, and Europe. These traditions held that certain precious metals, including copper, silver, and gold could be transformed into a fine white powder (elixir = powder in Arabic) that had miraculous spiritual and healing properties when ingested. Although the historical texts that specifically describe alchemical practices date back only about 2000 years, virtually all of the alchemical traditions held that their knowledge was very ancient, and had been passed down as an oral tradition among initiates since the very foundations of human civilization. There are tantalizing allusions to these lost traditions in the spiritual texts of many ancient cultures. A brief overview is presented below. REV 2:17 He that hath an ear, let him hear what the Spirit saith unto the churches; To him that overcometh will I give to eat of the hidden Manna, and will give him a white stone, and in the stone a new name is written, which no man knoweth saving he that receiveth it. Those who have consumed the white powder of gold typically report the experience of a spiritual sound deep in their awareness. This spiritual sound cannot be heard by the ordinary ear. It can only be heard by the spiritual ear. Is this spiritual sound the new name, “which no man knoweth saving he that receiveth it.”? For forty years, the Israelites consumed the white Manna in order to spiritually prepare themselves for entry into Canaan, the Promised Land. If the Manna represents an allusion to the alchemical white powder (elixir), then the Biblical legend of the golden calf may be an allusion to an ancient alchemical process. According to the Book of Exodus, Moses took the golden calf, burnt it in the fire, ground it to a powder, and cast into water for the Israelites to drink as an expiation for their sin. Exodus 32:20 And he took the (golden) calf which they had made, and burnt it with fire, and ground it to powder, and strewed it upon the water, and made the children of Israel drink of it. We know from Biblical records that Moses was the adopted son of a royal Egyptian family. Is it possible that the Divine Bread or Manna had its roots in ancient Egyptian alchemy? The ancient Egyptian texts state that when the Pharaohs spiritually prepared themselves to enter the abode of the Immortals (the Egyptian ‘Promised Land’) they were fed divine ‘Bread’. The sacred white substance called “Bread” was prepared in the ‘House of Life’ by the Egyptian high priests, and was considered the ‘food of the gods’. In general, the Udjat represented the divine healing power of the gods. It represented wholeness, health, and spiritual vision. Its function is clearly depicted in the ancient myth of Osiris, where Horus is said to have used the mysterious power of the Udjat to resurrect his father Osiris. After his resurrection, Osiris ascended through the sky to attain Eternal Life among the gods. The idea that the Eye of Horus was related to a divine substance which could be ingested is also indicated in the ancient Coffin texts, which state: “If Nu be hungry, Nekhbet will be hungry; if Nu be thirsty, Nekhbet will be thirsty,” (Spell 863). This litany ends by mentioning the Eye of Horus as the cure. “Your thirst and hunger are satisfied with the consumption of the Eye of Horus” (Spell 936). Later in the same text it is stated: “I live on Bread of white emmer washed down with Ale of red barley … I testify concerning the Eye of Horus to him.” (Spell 1013). The spiritual power of the White Bread is clearly indicated in the Egyptian texts. The Book of the Dead states: “Let there be given to him Bread and Ale which have been issued in the Presence of Osiris, and he will be for ever like the Followers of Horus.” The Followers of Horus were considered semi-divine sage-priests. Again, the texts state: “I eat Bread. I drink Ale. It should be noted that the sacred or divine Bread used by the Egyptians was not shaped like an ordinary loaf of bread. It was shaped into a conical or pyramidal cake, resembling the capstone of the pyramids. There was thus a deep connection in the Egyptian mind between the Pyramids or “Houses of Eternity” and the White Bread. This is made explicit by the use of the hieroglyphic symbol of the White Bread to indicate the gift of Life, a gift that is also indicated by the Ankh. The Ankh and the pyramidal loaf of Bread are synonymous symbols, indicating the gift of Life. The symbol of the White Bread was also used in the hieroglyph that meant “Peace, Contentment, Offering”. It was represented by a cup that contained the sacred Bread placed on a reed mat. This constituted the hieroglyph “Hotep”, which can be found as an inscription over every tomb in ancient Egypt. Many pharaohs and noble persons in ancient Egypt included the word “Hotep” in their name. For example, the famous Egyptian high-priest, who was the patron of Egyptian medicine and the first architect and builder of an Egyptian Pyramid was named Imhotep. The hieroglyph of his name is given below. The symbolic connection between the sacred Bread and the Pyramid is made explicit by the pyramidal shape of the Bread-cakes and the capstone of the Pyramids, called the Benben. The Benben was the proverbial “Philosopher’s Stone” of ancient Egypt. It symbolized the primordial mound that rose above the waters of the Abyss in the very beginning. It was also revered as the “seed of the gods”, the “ashes of the Phoenix (benu bird)”, and the embodiment of Ra-Atum, the Sun-God. It turns out that the Egyptian word for gold is “Neb”, which is just the inverse of “Ben”. Is it possible that the sacred capstone (Ben) and the sacred White Bread were produced from an inverted form of gold (Neb) that appeared as a fine white powder? The ancient Vedic tradition in India also sang the praises of a mysterious sacred substance called Soma, the nectar of immortality. It was prepared and consumed by the Vedic priests in order to attain health, longevity, spiritual illumination, and entry into the abode of the immortal gods. 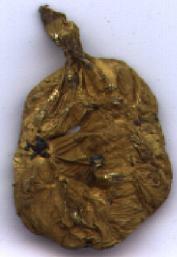 In this tradition, Soma is also closely related to gold. Although modern scholars have traditionally assumed that the Soma was an hallucinogen produced from plants, some scholars have now have begun to suggest that the concept of Soma involves a metallurgical or alchemical allegory. In the ancient Rig Veda, Soma is said to have been fetched from heaven by a divine Eagle who extracted it from a bronze (or metal) fortress. (Rig Veda 8.100) The Eagle who fetched the Soma from Heaven may very well be a Vedic reference to the divine Phoenix. The fact that the Soma was kept in a metal fortress provides a clue that the Soma had its true source in the metals. However, the Vedic texts generally state that Soma has mountains (girau) and stones (adrau) for his body. Soma is also described as dwelling in the mountains (giristha) or growing on the mountains (parvata vrdh: RV. 9,46). Terrestrial mountains are the abode of Soma (RV. 9,2). The texts state that the Soma was plucked from the rock (adri) by the mountain dwellers and then bought by the priests (kavis) who prepared the Soma. The Sanskrit term kavi not only means priest-poet, but also smith, metallurgist, or alchemist. Although the Soma is said to grow on or in the rocks in the form of shoots or stalks (amshu), this term can easily be interpreted as the veins or stalk-like protrusions that are often found associated with certain ores, such as quartzite gold. The texts state that the Soma was specifically plucked from two rocks (adrau) which are either reddish brown (aruna) or yellow (hari) in color, colors that are typical of gold bearing ores. For example, quartzite deposits often contain native yellow gold veins and protrusions, which gives them a yellow or golden color, while gold-platinum ores often appear as reddish-brown mineral veins. Because these veins appeared to be growing on or in the mountain rocks, they were compared to the stalks of a plant to be plucked from the rocks. Once the ores were collected by the mountain dwellers and bought by the priest-metallurgists, the ores would be crushed and washed free of impurities. The crushing or pressing of the Soma is abundantly described in the Rig Veda. It involved the use of grinding stones, which were said to make a loud noise. The use of grinding stones instead of a mortar and pestle was a common practice in ancient metallurgy. It appears that several stages of grinding, washing, cooking and filtering were involved. A woolen fleece (avi) was used as the filter. The use of woolen filters was also very common in ancient metallurgy, and were often used as a means of collecting gold particles from running streams. The grease or oil on the fleece would capture the tiny flecks of gold, but would not capture particles of sand or grit, which would be wetted by the water and washed away. Some have speculated that the Greek myth of Jason and the Argonauts, who sought the Golden Fleece, had its origin in this ancient practice. The use of a woolen filter during the washing of the crushed ores would thus allow the priest-metallurgists to collect the gold particles. After crushing, washing, and filtering the Soma would be cooked in water. As the juice began to mature, it was said to become clothed in robes of milk. In other words, it assumed a white appearance, resembling milk or the moon. Due to its white color it was often referred to as the Milk of Heaven or the Milk of God, indicating its creative spiritual potency. It is interesting to note that when monatomic elements are placed in water they form a permanent suspension that looks exactly like pure white milk. The Hebrew translation of this word literally means, “What is it?” Manna is referred to repeatedly in the Egyptian Book of the Dead, Hermetic scrolls and the Bible. It is the mfkzt (Milk of Hathor/Ishtar), depicted on ancient stone carvings and pharonic cartouches, being offered to feed the Ka (spiritual body) of Pharaohs and was the essential key to transforming them and others into Light Beings. One initial discovery of its ancient manufacture and storage was found by the Petrie expedition in search of the biblical holy mountain of Moses, then called Mount Horeb and presently known as Serabit el Khadim (on the Sinai Peninsula). They found, within the ruins of a temple dedicated to the Goddess Hathor, alchemical equipment including a metallurgist’s crucible and a considerable amount of pure white powder, concealed beneath flagstones. In the late 1970’s an Arizona farmer named David Hudson was conducting soil testing when he came upon an intriguing anomaly. The presence of an unidentified material led him on a painstaking journey, involving over a decade of research and millions of dollars in analysis, to identify this substance. (His story can be found on several different sites on the World Wide Web.) In short, this substance was found to be noble metals in a state not normally recognizable: precious metal elements in a non-metallic form, which could manifest as white light! Hudson named these materials Obitally Rearranged Monoatomic Elements or ORMEs. Most current researchers refer to this material as ORMUS or m-state. ORMUS materials are found in the Platinum Group and are comprised of the following known elements; Cobalt, Nickel, Copper, Ruthenium, Rhodium, Palladium, Silver, Osmium, Iridium, Platinum, Gold and Mercury. They possess an inherent ability to present themselves in a different atomic state. Their ever-allusive presence, was not previously qualitatively identified, but has been known to exist. They are naturally occurring and can be found in soil (unless it’s been depleted), in plants and even bee pollen. So, it’s been out there all this time and may be an active catalyst for hundreds of age-old remedies. White Powder of Gold is ORMUS material precipitated out in an alchemical process. Liquid Manna contains White Powder Gold in suspension! Knowledge of its production was never completely lost. Alchemists have passed integral kernels of this process on throughout the ages. Modern Wizards (you know them as Quantum Physicists) have brought science to a whole new level of understanding, which we can more readily grasp and have helped us to better understand things like quantum leaps between atomic states and superconductive properties.